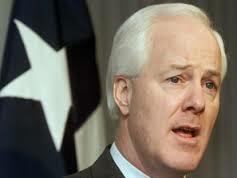 Update: Senator Cornyn will be at the Downtown Cafe at 5:00 pm. Does anyone have questions they would like to ask the Senator? Senator John Cornyn will be at the Downtown Cafe on the Square in Weatherford at 6:00 pm on Monday, June 30th for a meet and greet. Come visit with our United States Senator as we prepare to Keep Texas Red! All are invited and no reservations are required. I thought the annual “Rattlesnake Roundup” was held in Sweetwater, TX back in March? There are so many forked-tongued sidewinders in office in Texas, it would take a weekly roundup for years to clean out their nests. He’s a traitor to his own State, how about the border John? All his support of NDAA , Patriot Act(s), and every rubberstamped police state piece of legislation,….’ol Cornman approves. Maybe he will wear a sponsors jacket like NASCAR drivers, so we know who his corporate owners are. (2013, RCV 206) Senator John Cornyn of Texas voted to end debate and allow Senate Democrats to re-insert funding for ObamaCare into the Continuing Resolution to fund the federal government. Although Cornyn did vote against the final bill, he and all Republicans knew that voting for cloture to end debate would allow Senator Harry Reid to fund ObamaCare by a party-line vote, and thus a vote for cloture was a de facto vote to fund ObamaCare. (2007, RCV 42) Senator Cornyn voted for the Fair Minimum Wage Act that increased the federal minimum wage from $5.15 per hour to $7.25 per hour in 2007. Raising the minimum wage is a bad idea because it reduces employment especially among low-skilled workers. The cost of raising the minimum wage is passed onto consumers in the form of higher prices for goods and services. (2012, RCV 251) The fiscal cliff was a fake crisis created by Congress and the president. Senator Cornyn voted for the infamous New Year’s Day 2013 fiscal cliff deal that raised taxes on 77 percent of U.S. households and contained no real spending cuts. Senator Cornyn voted against three of the best, most fiscally conservative budgets ever proposed in the United States Senate. He voted against Senator Mike Lee of Utah’s FY 2013 budget proposal to balance the budget in five years and save $7 trillion over ten years. (2012, RCV 101) He also voted against Senator Rand Paul of Kentucky’s FY 2012 and FY 2013 budget proposals to balance the budget in five years and save more than $8 trillion over ten years. (2011, RCV 80; 2012, RCV 100) Instead, he favored budget plans that either fail to balance the budget or fail to specify clearly how balance would be achieved. Although he later withdrew his support (under withering fire from internet freedom advocates across the political spectrum), Senator Cornyn voted for the Protect Intellectual Privacy Act (PIPA) in committee. His vote helped move PIPA to the Senate floor, where it met a well-deserved defeat. Under PIPA, the government would have the power to shut down millions of websites. This is economically destructive and a gross violation of our constitutional right to free speech. In 2007, Senator Cornyn voted for the FISA Amendments Act, which granted immunity to U.S. telecommunication companies for giving information about their customers to the government without a warrant. This is one of the key provisions that allowed the NSA to conduct its now-publicized warrantless blanket surveillance of American citizens. Since entering office in 2002, Senator Cornyn has voted to raise the debt ceiling eight times (including the debt ceiling increase contained in number 1, above). Raising the debt limit only encourages reckless spending in Washington. Congress needs to cut spending and balance the budget—not continue to increase our national debt without any spending reforms or reductions. (2006, RCV 25) Although he was not present in Congress when the original USA-PATRIOT Act was passed, Senator Cornyn has been an enthusiastic supporter of the controversial law, voting to permanently reauthorize most of its provisions in 2006. Despite its attractive-sounding title, the so-called Patriot Act violates our Fourth Amendment right to privacy, authorizing unprecedented surveillance powers that permit the federal government to spy on U.S. citizens without a warrant. — Julie Borowski and Dean Clancy contributed to this list. With Repugs like Corn, who needs Dims ? Cornyn voted with Senate Democrats worked together to stop Cruz’s filibuster in a Feb. 12 cloture vote, passing a measure that completely suspended all limits or caps on the national debt. Obama demanded the measure. He supports every so-called “free trade agreement”, TARP bailouts, Medicare Prescription socialism, every war, every defense budget, FISA court expansion, and an internalized police state. If you like the direction in which this country is headed, you will like Cornyn. With “Republicans” like this, who needs Dems ?